Maccaferri played again a primary role in the International Seminar on New Construction Materials, Techniques and Design in Bridge, Tunnel and Road construction, suitable for infrastructure development in inaccessible border areas. The two-day seminar, aimed to evaluate and identify latest techniques and construction materials for building roads, bridges and tunnels, has been organized by Border Roads Organization (BRO) in partnership with Indian Institution of Bridge Engineers, Delhi State Centre (IIBE, DSC) and in collaboration with Ministry of Road Transport and Highways, National Highways Authority of India, Central Public Works Department and Ministry of Railways. 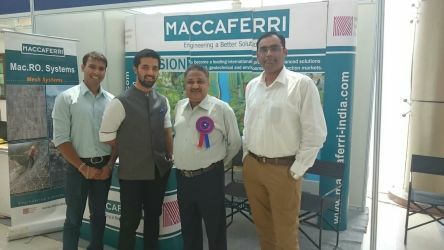 Maccaferri exhibition booth focused on landslide and rockfall mitigation measures; an expert lecture on this subject has been delivered by Maccaferri COO and Director Mr Gharpure. Rockfall protection and rockfall mitigation are key elements in the security and safety of infrastructure, mine works, buildings or people. Even small rockfalls, or debris flows can block infrastructure and can have far-reaching economic effects beyond the immediate disruption. This also applies to buildings or other installations at risk of damage from rockfalls, avalanches or debris flows. Contact us, we will welcome you with further info.